Artists from the fellowship reunited to continue this exploration (the first group of IAF Fellows in its history to do so) on a devised multi-lingual adaptation of The Comedy of Errors, exploring the power of international voices and ideas coming together to expand the possibilities of classical revivals. The production of this play was to underlie our company’s continued vision to show the universality and timelessness of these plays, bring to the stage a broadly comedic and highly theatrical production of one of Shakespeare’s most riotously funny comedies, and deliver a message that is all too necessary in today’s age – that a diverse group comprising of many personalities, can overcome misunderstandings and successfully work together towards a common goal, reuniting families and communities, and doing so with energy, enthusiasm, love and commitment. In today’s increasingly polarized world, art has a responsibility to open hearts and minds by crossing borders: national, cultural, and philosophical. This development was the first step towards a true “International Actors’ Ensemble”. For our first project post-Globe we were able to ignite artistic partnerships with people from around the world. Mexico’s creative community was the first to reach out to help start this endeavour, allowing our rehearsal process to begin that July in the city of Xalapa. We spent one month in residency on a beautiful farm, where we will be able to not only work with each other but also with amazing Mexican designers to develop set, lighting and costumes to take on the road. We also encouraged participation in our project through creative and educational workshops. 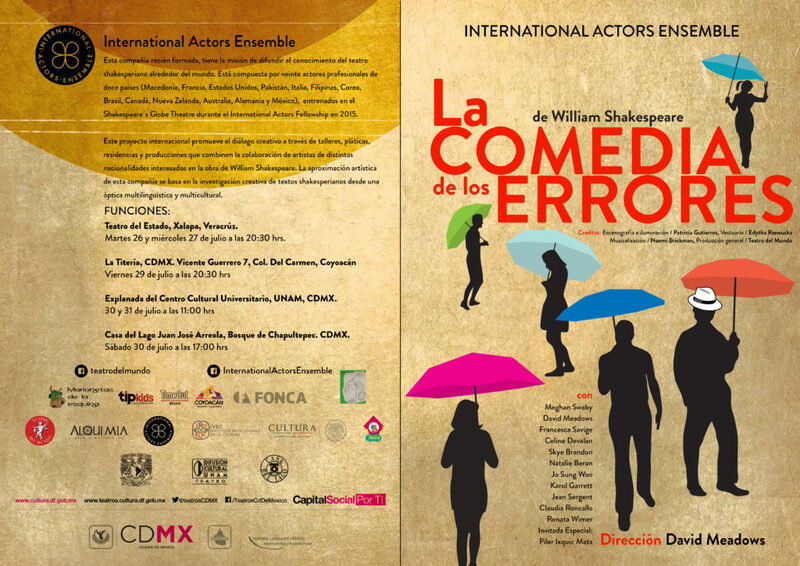 IAE’s Comedy of Errors premiered in Xalapa and Mexico City at the end of July. William Shakespeare’s THE COMEDY OF ERRORS is a riotous, farce-paced comedy about mistaken identity, the problems money can create, the problems money can fix, conflict resolution, international relations, and nuns with pasts. This is a broad, fast, crowdpleasing comedy by a young playwright keen for a hit – that one big smash that will make his name and set him up. It is thus imperative that this production mine its comic wells – both in the script and in the company of actors – and give our audience what is promised in the play’s very title, COMEDY: fast-paced, truthful, detailed, intelligent, disciplined, raunchy, side-splitting, world class comedy. For more of our supporters, please view our Support page.